Microball bearings support the electromagnetic microgenerator. ISR Director Reza Ghodssi (ECE/ISR) and his former students C. Michael Waits (EE Ph.D. 2008) and Mustafa Beyaz (EE Ph.D. 2011) are co-inventors of U.S. Patent 9,083,208, “Ball Bearing Supported Electromagnetic Microgenerator,” issued on July 14, 2015. As the critical dimensions of devices continue to shrink, novel methods and apparatus must be developed to overcome device limitations at smaller length scales. Microelectromechanical systems (MEMS), such as micro-fabricated generators, motors or other electromechanical devices, may require suitable rotational speeds for operation on a micron to sub-micron length scale. Unfortunately, conventional designs, such as air bearing rotors and the like, break down due to mechanical and vibrational instabilities, such as mass-induced mechanical instabilities caused by the addition of magnetic materials to the rotor. 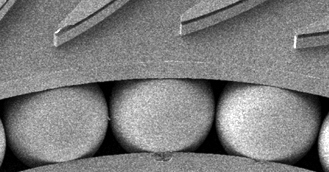 This versatile microball bearing supported microgenerator improves micro electromechanical devices and methods for forming them. It allows an micro electromechanical device, such as a motor or generator or other suitable MEMS device, to be operated at sufficient speeds (e.g., rotational rate of a rotor or the like) to function on a micron length scale or below. Waits is a team leader in the Energy and Power Division of the Sensors and Electron Devices Directorate at the Army Research Laboratory. Beyaz is an assistant professor in the Electrical and Electronics Engineering Department at Antalya International University, Antalya, Turkey. As graduate students, both worked in the MEMS Sensors and Actuators Lab on the project to develop a microball bearings-supported electromagnetic micro-turbo-generator.